New York’s abortion law was regulated in the criminal code. You could say: "Abortion is not a crime. Patients across the state have been denied care because New York’s cruel and unconstitutional law regulated abortion care in the criminal code." The state’s outdated law had been last amended in 1970, three years before Roe v. Wade, and did not reflect constitutional protections. That state’s law was effectively a ban on abortion after 24 weeks of pregnancy unless there was an immediate threat to the life of the patient. The portions of the state's laws that regulated abortion included the following: Penal §125.05, §125.20, §125.40-60 and Pub. Health §4164. Written almost 50 years ago, the New York State law did not reflect current medical realities and delayed care. The law stipulated that abortions could only be performed by a doctor. This discouraged Advanced Practice Clinicians (APCs), who regularly provide abortion care within their licensed scope of practice across the country, from providing early and safe abortion care in New York simply because they didn’t exist in 1970 when the law was written. New York’s abortion law fell short of complying with federal rulings because there were no provisions in the law to allow for later care in cases where the pregnancy was not viable or where an abortion was necessary to protect the patient’s health. New Yorkers can find themselves pushed past this arbitrary line for any number of reasons, and then cannot get care without leaving the state, if they can afford to do so. These stories were collected by the New York Civil Liberties Union in their report, Critical Conditions. In New York State, women were being forced to carry non-viable pregnancies or pregnancies that threaten their health, or to leave the state for treatment. In other cases, patients with unintended or unwanted pregnancies are pushed past the state’s 24 week cut-off. The state’s restrictions on abortion, and on who can provide them, created unnecessary burdens that have been known to delay and deny care. The RHA addressed these. You could say:"New Yorkers were having to leave the state for care that they should have been able to receive here at home. Others were being forced to carry pregnancies that threaten their health, or that are not viable." New York State criminalized abortion and placed medically unnecessary requirements on abortion providers. Restrictions have been known to delay or denials care. In doing so, the state violated the rights of patients to access safe and legal abortion that were established by Roe v. Wade. New York abortion law fell short of constitutional protections and did not reflect current medical realities and practices. This has resulted in reduced abortion access and women in critical health situations being sent to other states to get the care they need or simply denied care altogether. Year after year medical practitioners in New York State were having to explain to their patients that they cannot continue to provide care moments after giving them a painful, terrible diagnosis about their pregnancy. In other situations, New Yorkers seeking an abortion for an unintended or unwanted pregnancy find themselves on the wrong side of an arbitrary line that they didn’t know existed. A number of factors, often in combination, contribute to patients seeking later care. These can include late discovery of the pregnancy, difficulty accessing care or paying for it, disagreements with a partner, difficulty making a decision, and a lack of information. In many cases, these patients will still be denied care in the state. Whatever their circumstances or reasons, patients are then forced to travel to one of a handful of providers elsewhere in the country for care. In addition to travel costs, they’ll pay up to $30,000 of their own money for a procedure they should be able to get here at home, covered by their medical insurance. And those are the lucky ones, because they can afford to receive the care they need. The Reproductive Health Act (RHA) updated New York’s cruel and unconstitutional abortion law and removed a critical barrier to access for many patients. You could say:"The Reproductive Health Act (RHA) decriminalized abortion and removed unnecessary, burdensome regulations that have been known to delay, burden or prevent the provision of care." The Reproductive Health Act (RHA) was a bill before the New York State Legislature, and refers to S.240/A.21. It was sponsored by Deborah Glick in the State Assembly and Liz Krueger in the State Senate. Some version of the bill has passed in the Assembly since 2013, but failed to even get to the floor for a vote in the GOP-controlled State Senate. The bill established that reproductive healthcare is a fundamental component of an individual’s health, privacy, and equality. It clarified a person’s right to determine their own reproductive choices with regard to contraception, sterilization, and pregnancy outcomes. 1) Decriminalized abortion, moving it from the criminal code into public health law. 2) Brought NY state law in line with federal standards by removing restrictions to abortions later in pregnancy in cases where the pregnancy is not viable or there is a threat to the health of the pregnant person. 3) Ensured that licensed medical professionals, not just doctors, can provide abortion care within their scope of practice. New York’s post-RHA law now meets the federal standard by establishing that abortion care can be provided prior to 24 weeks from the commencement of pregnancy for any reason or throughout pregnancy when a fetus is not viable or when there is a risk to the life or health of the pregnant person. In doing so, the RHA clarified that a health care practitioner who is qualified and licensed to do so, not just a doctor, can administer care. This means Advanced Practice Clinicians (APC’s) including Nurse Practitioners, Physicians Assistants, and Certified Nurse-Midwives whose training includes abortion care may provide it, improving access in medically underserved areas of the state. The RHA repealed other medically unnecessary provisions in the health law regarding abortion such as a hospitalization requirement and a second physician requirement for later pregnancies. These regulations are not part of clinical guidelines established for the procedures by medical associations and have been struck down in similar cases by the Supreme Court as they are known to delay and deny access to care. New York’s abortion law was unconstitutional as it did not meet federal standards established by Roe v. Wade and subsequent decisions. 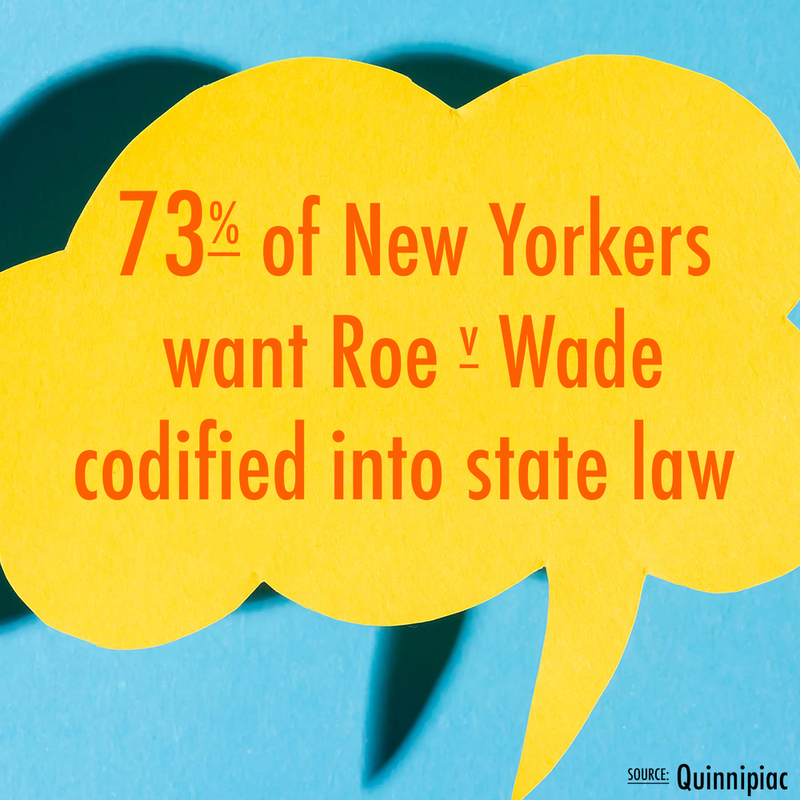 You could say:"New York’s abortion law didn’t meet the Roe standard. And with Roe being threatened at the federal level, it is more important than ever for states to protect access to abortion with no patient left behind." Roe and subsequent decisions established a baseline for abortion access: states may not restrict a person’s right to access an abortion prior to viability and throughout pregnancy in cases where there is a threat to the health or the life of a patient. Because on its face New York law criminalized abortions performed after 24 weeks in cases where the pregnancy is not viable or where there is a threat to the health of the patient, it did not meet federal constitutional standards. While these rulings at the federal level should have superseded state law, providers were wary of offering care that was inconsistent with the letter of the state’s criminal code. As a result, patients were denied care. Furthermore, Supreme Court rulings establish that the state may not place an undue burden on a person’s ability to access an abortion (Planned Parenthood v Casey). New York placed restrictions on the provision of an abortion that the Supreme Court has struck down because they are known to delay access to abortion care (Thornburgh v ACOG). • "New York State now treats abortion as health care, not a criminal act. Abortion is finally regulated under public health law, rather than the criminal code." • "The RHA ensures that qualified health care providers with appropriate training and expertise can provide safe abortion care without fear of punishment." • "Providers are now free to meet the needs of their patients, when people require care it can be offered close to home instead of across state lines or across the country." • "New York has enshrined the protections afforded by Roe v. Wade into state law, ensuring patients can access the care they need even if federal protections are rolled back." • "Abortion is no longer stigmatized as a criminal act by the State of New York." The RHA and similar measures had stalled in the State Senate in past years. However, the new federal reality means that we can no longer look to federal protections to ensure that abortion remains safe and legal. New York residents needed protections in New York state law. Thanks to changes in the State Senate, the new political reality made the law possible. You could say: "We should be expanding access to healthcare when people need it. The premise of opposition talking points on expansion require us to ignore the lives of real women who have faced heartbreaking scenarios across our state." As a result of this bill, more New Yorkers will have access to abortion. Increasing access is necessary, because there are communities in New York state where abortion is difficult to access and patients suffer from not being able to get the care they need here in their own state. The RHA ensures that more New Yorkers have the access they need, and we’re proud to affirm the rights that New Yorkers currently have under federal law. The federal government and states across the country are pushing abortion out of reach. New York should be proud to be going in the other direction. And there is still work to do to make sure no patient is left behind. Note: Stories of real people and their families who have had to travel for care due to restrictions are important in providing context. Our story is here, others are available here. We cannot write a law that accounts for every potential complication in pregnancy or in the life of a pregnant person. But we can write laws that embrace this complexity, trust women and their doctors, and allow care rather than harmfully restricting it. Doctors should be treating patients based on established medical standards and the patient’s health, not the criminal code. Abortion is healthcare, not a crime. You could say: "Determining whether or not an abortion is necessary to protect a woman’s physical or mental health should be left to the sound professional judgement of the attending medical professional. Every pregnancy is unique. Every patient's circumstances are unique. We needed a law that recognizes the complexity of pregnancy." In fact, the very nature of these questions speaks to the inherently distrustful foundation of the objections. Pregnant patients, like all patients in medical settings, should be trusted to decide the course of their own medical care. These decisions should be made in counsel with their doctors without having to take restrictions by outdated and medically inaccurate laws into account. You could say: "Abortion is healthcare and should not be conflated with a violent assault. Violent attackers should be punished and there are tools in the law that prosecutors can use to do so. Insisting that we must criminalize women’s health care in order to protect women from violence is perverse, cruel and legally unnecessary." Violence against women during pregnancy is a serious public health concern. Where violence results in the loss of pregnancy, there are several laws in place that punish this crime. Thus, District Attorneys have a number of various tools to deter and punish crimes that result in fetal loss. Our state law already has civil and criminal penalties for anyone acting unlawfully, and that includes people who harm a pregnant woman. These criminal penalties, which carry more severe punishments, will remain in place to ensure that a person who attacks a pregnant woman is prosecuted. The New York State Coalition Against Domestic Violence issued a statement in support of the RHA. Passage of the bill would ensure victims of domestic violence, and all New Yorkers, are able to access abortion care when they need it. You could say: "Abortions earlier in pregnancy have been safely performed by other qualified medical professionals across the country for years. 16 other states allow Advanced Practice Clinicians (APCs) to provide early abortion care and studies have shown that there is no difference in the standard and safety of early abortion care between physicians and APCs." The Reproductive Health Act allows early abortion services to be performed in New York State by licensed, highly skilled, qualified health care providers whose scope of practice includes pregnancy-related care. APCs are especially important in our health care delivery system because they are more likely than physicians to practice in medically underserved settings. In New York State, APCs are more likely to provide care to traditionally underserved populations – such as rural communities and low-income communities. Supporting these clinicians as providers of early abortion will make abortion safer and more accessible for New York’s most vulnerable populations. The practice of medicine has changed drastically since 1970, and Advanced Practice Clinicians (APCs such as nurse practitioners, physician assistants, and licensed midwives) that did not exist in the law now provide a range of medical care that was once provided only by MDs. You could say: "This is an attempt to discredit and stigmatize abortion providers, who, like all medical professionals, are compelled to operate within legal boundaries and within their licensed scope of practice. The RHA just ensures they can actually do that." The specter of malpractice by abortion providers is unfounded, and only serves to make the provision of care less safe for providers and their patients. Some have tried to justify the need for existing criminal penalties by invoking the case of Kermit Gosnell. Kermit Gosnell was a criminal who broke existing laws far beyond New York’s previous abortion statute and violated medical ethics and standards. He was rightly tried and convicted for those crimes, and in no way reflects the standard of care. Any health care professional who operates outside of their scope of practice or not in accordance with medical standards is subject to liability, including civil and criminal penalties as well as loss of licensure. When abortion is stigmatized and regulated outside of other medical care, the provision of abortion is pushed out of the mainstream healthcare delivery system and into a narrower set of providers and facilities. Abortion must be regulated like any other healthcare procedure to ensure that the systems in place to protect patients are afforded to those seeking abortion care. You could say: "The RHA removed medically unnecessary, outdated, and burdensome requirements that have been known to delay and deny care. These requirements are not recommended in clinical guidelines for abortion procedures by medical associations and similar restrictions have been struck down by the Supreme Court. Unnecessary regulations like these make abortions more expensive and less available to those who need it. The RHA was supported by ACOG and the AMA. The RHA removed the Public Health Law §4164 Hospitalization Requirement. The Supreme Court has held similar provisions in other states unconstitutional (Thornburgh v ACOG), and the New York State Department of Health has recognized that this provision of New York law is unenforceable. The Reproductive Health Act repealed this section. The Supreme Court has struck down as unconstitutional similar provisions in other states in cases where delay caused by waiting for a second physician’s arrival could endanger the woman’s health (Thornburgh v ACOG), and the New York State Department of Health has recognized this provision as unenforceable in such cases. The second-physician law imposed a rigid set of requirements that burdened the delivery of care and does not reflect medical realities of abortion later in pregnancy or the standard of care. Further, medically unnecessary restrictions like maintaining unnecessary staffing levels do not improve patient safety or quality of care and make abortion more difficult and expensive to obtain. Some of this comes from removal of the Second Physician requirement. The Supreme Court has struck down as unconstitutional similar provisions in other states in cases where delay caused by waiting for a second physician’s arrival could endanger the woman’s health (Thornburgh v ACOG), and the New York State Department of Health has recognized this provision as unenforceable in such cases. The second-physician law imposed a rigid set of requirements that burdens the delivery of care, does not reflect medical realities of abortion later in pregnancy or the standard of care, and is legally unnecessary. Further, medically unnecessary restrictions like maintaining unnecessary staffing levels do not improve patient safety or quality of care and make abortion more difficult and expensive to obtain. Furthermore, the RHA does nothing to remove rights from any persons born and alive, under any circumstances. You could say: "So-called “Partial-Birth Abortion” is an inflammatory term not recognized by the medical establishment. It is used to exploit women’s medical situations as a means of stigmatizing abortion and blocking access to reproductive health care. That said, the federal “Partial-Birth Abortion Ban Act” was not affected by passage of the RHA. So-called “Partial Birth Abortion,” though not a medical term, would not be allowed under the Reproductive Health Act. In 2007, the United States Supreme Court upheld the federal law (Gonzales v Carhart): it is in effect, state law cannot override the federal law and providers in New York, along with providers in every state, must comply with it. You could say: "The abortion rate for black women is higher than for white women primarily for two reasons: lack of access to preventative care and the perpetuation of the cycle of poverty. We should be addressing these problems, and the alarmingly high maternal mortality rate for black women in this state rather than pushing healthcare out of reach." Providing black women with respect and agency related to their reproductive health care decisions is critical to honoring their humanity, reversing past wrongs and improving their health and their family’s wellbeing. Laws that limit access to reproductive and pregnancy-related health care only work to increase the mortality rate among black women and low-income women (and their children). The maternal mortality rate for black women is four times higher than that of white women in the state (Source: CDC) and twelve times higher in New York City (Source: NYC.gov). Think we're missing something? Head over to the contact page and leave us a comment!